I had reason to doubt my own sanity this morning as I got out of bed in the dark and walked up the road to the market in the rainy dawn. Then a couple came round a corner carrying a Christmas tree and then another couple also with a tree. You may conclude that there are those who have reached further depths of depravity than myself or you can celebrate the Christmas spirit that is undiscouraged by the meteorological conditions. Arriving at the market, I was amazed to find it crowded at this early hour with a brisk trade in Christmas trees, further evidence that the approach of the festive season is underway. There were pine wreaths and holly too, but no mistletoe to be found anywhere. “It’s too early for kissing yet!” quipped Jo, one of the traders, by means of explanation. 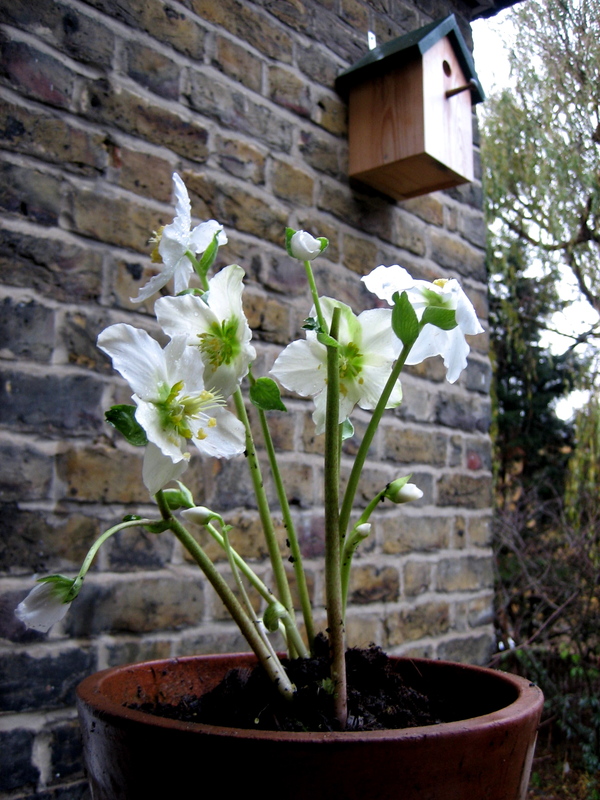 I bought myself a Christmas Rose (Helleborus Niger) for £4 to stand in a pot outside on my kitchen window sill to give me some inspiration when I look out at the endlessly falling rain. I love their waxy petals that glow in whatever light there is and incarnate the silent anticipation of these weeks leading up to Christmas. Ahh, I wonder if one of the tree purchasers was me. I carried a surprisingly heavy christmas tree all the way back to Spitalfields on Sunday, having fuelled up on one of Mr Gellatlys fine mince pies on the way there, at your most excellent recommendation.